No one ever said it'd be easy to be a Peace Corps volunteer. Over the last few days I've been revisiting some old questions. Like, "am I an effective volunteer?" or "what sort of impact am I having?" The answer to both of these questions is an unequivocal "I don't know." I think I've been frustrated with the quality of my service lately because it doesn't seem like I'm making any sort of progress. Teaching at school isn't really all that bad, but neither is it extremely great. The kids at Mondial have some good days, but the bad days are just as plentiful. Moreover, many projects I've started seem to be failing or going nowhere. On the other hand, I realize it's hard to gauge one's impact without the benefit of hindsight. Even still, sometimes curiosity gets the best of you and you just have to ask, "have I changed anything?" It's rather frustrating when you look for results and can't find any. I suppose I tend to look for evidence of something big, something tangible, when in reality the fruits of my labor are probably more indistinct. In addition, it seems I've become more cycnical lately. I remember the pessimism of some of the volunteers I met when I first came to Romania in May 2007. They'd been in country for nealry 2 years, and so they were on their way out. Some of them apparently had a pretty difficult experience, and their depiction of life as a PCV in Romania was decidedly less than flowery. Witnessing their pessimism was somewhat shocking for a bright-eyed, gung-ho newbie like myself, and I promised myself that I'd never become like them. I still refuse to be like them. I mean, there are many things about my experiences up to now that I cherish. However, it certainly hasn't been all hunky-dorey and I can't seem to help but complain a little. In fact, feel like my mood has been more negative than usual the past few weeks. A lot of things that usually wouldn't bother me have been getting on my nerves. I seem to be less tolerant of Romanian culture, less patient. For example, I find myself asking things like "why can't this sidewalk be a flat, paved surface?" or "why are the roads full of holes?" or "why don't people put their trash in the trash can?" or "why is it every that construction project around here takes several years to complete?" or "why won't the waitress look at me when she walks by?" or "what do you mean the documents aren't available?! In the States such information would be public." I think that last question touches upon part of my problem: I've fallen into the trap of comparing aspects of Romanian society with what I'm accustomed to in the States. Often the comparisons are unfair. Usually I'd write off my daily annoyances as the result of cultural differences. I'd say, "just accept it, this is how things are in Romania." However these sort of differences have been getting to me more and more lately. Perhaps it's that I want to see things change, and they aren't (at least not according to my expectations). Or perhaps it's that I've been here for nearly 2 years now, and I miss being home-- I can see the finish line approaching, and I can't help but envision being back in a land where everything is as it should be. These kind of thoughts are horribly ethnocentric of me, and I hate to admit that they've crossed my mind at some point or another. I shouldn't be thinking in such terms. But, I believe the main contributing factor behind my current cynicism is that my frustrations about being a good volunteer are spilling over into my daily life, making me more sensitive to these little, admittedly insignificant bothers. It just seems that not much is going my way at the moment. Then again, I've felt this way before; it doesn't last forever. During our pre-service training they warned us that Peace Corps service can be like a roller coaster. There are good periods, and bad. Moreover, you fortunes can change suddenly, inexplicably and without warning. One week may be terrible, and the next may be awesome. It's even happened that I've experienced both extremes all within the space of one day. It just happens. Like I mentioned above, the finish line is approaching. I'll be leaving Romania this summer. I've recently started prepping people for my departure, which has made me begin to realize just how hard it will be to leave. While I certainly miss my family and friends back in the States, this place has become like a second home for me. Life here is now familiar. I've grown accustomed to the sights and sounds of Lugoj. I've made many friends. My apartment is comfortable. And, what is more, I have a land-lady that does my laundry for me (Heaven forbid I should have to do my own laundry when I return to the States!). More than anything, the thought that I'll be leaving reminds me that I'm running out of time to do everything I want to do. Added to my feelings of ineffectiveness, melancholy about leaving, and grief over the lingering gloomy weather is one more thing: anxiety about what I'll do after Peace Corps. I honestly have absolutely no idea what I'm going to do, and every time someone asks me about it I feel even more pathetic. I had hoped by now I'd have some clear plan for my life, but things are still as murky as they were at the start. However, I'm holding out hope that something will turn up. Something always does. On Thursdays after my normal classes at school I go to the Kid's Club to give English lessons to the young'uns (3rd to 4th graders). They're fun, but can be quite tiring. After a couple hours with them, I usually hang out with the kids in Tibi's art studio, which is adjacent to my English room. Filip, a kindergartener, is usually there when I show up. Filip's inquisitive little eyes are framed by Steve Urkel-esque glasses, and his wispy blond hair sprouts in messy tufts. During one particular encounter, few weeks ago, Filip looked up at me through his thick glasses and asked in his meek little voice, "Domnul, aveti proteza?" (Mister, do you have dentures?). At first I was sort of shocked by his audacity. But then again, when I was his age, I had the same chutzpah with strangers (after all, it was me who, perched on my mother's lap while riding a train, had accused the woman sitting next to us of being "fat. "I then proceeded to play with her arm while extoling her flabbiness. She was indeed a large lady. I was just calling 'em like I saw 'em). So I knew Filip was asking out of pure curiosity. Plus I realized that dental care in Romania is not necessarily the priority it is in other, more affluent countries; the sight of missing teeth (or perhaps gold teeth) is much more common around here than seeing someone who has benefited from braces. So, I responded to Filip, more amuzed than offended, "Nu! is naturali," flicking them with my finger. An old woman needs a new pair of dentures, so she goes to see the dentist and asks how much they'd cost. The dentist informs her they'd be anywhere between 300-500 euros. Discouraged by the price, the lady goes home. She happens to look in the newspaper and finds an advertisement for 'slightly used' dentures. Hoping to find something more within her price range, she goes to the address listed in the ad. When she gets there a man shows her to a giant table covered in all sorts of dentures. She takes a couple of hours to go through the whole collection, finally selecting 2-3 possible pairs. However, none of them is a perfect fit. The man assures her that if she can't find anything right now, she should come back next week when he'll have more. So, the lady comes back the following week, and sure enough, he has some new additions. Once again, she scours the collection--trying them out, looking in the mirror, etc. Finally she finds a pair that seems just about right; they need only minor modification. She asks the man if he can make the necessary adjustments, and he responds, "lady, I don't make any modifications. I just get what I can find at the graveyard." Bada-bing. That's today's denture-related joke. Now excuse me while I go floss. It was one of those days that started off with a bad omen. Instead of getting on the train to Timisoara, I boarded the train heading to Caransebes, which is in the complete opposite direction. This is a mistake I never ever make. But then again, given how much I travel by train these days, I suppose it was bound to happen at least once. The train I intended to take was due to leave Lugoj at 8:47am from line 2. Or so the arrivals/departures board indicated. So, when a train pulled into the station on line 2, I climbed on straighaway, without thinking much about it. For some reason I hadn't noticed that the train had come from the wrong direction (which meant it'd also be leaving in the wrong direction). Moreover, if I had only checked the sign on the side of the wagon as I climbed on, I would have noticed it wasn't the right train. However, I didn't. In any case, everything seemed in order-- the train had arrived on line 2 about when I was expecting it to and it even pulled away at exactly 8:47. It was only when the controller came to check my ticket that I discovered what was wrong. He looked at my ticket with a puzzled expression, and told me I must have made a mistake. This train was going to Caransebes, not Timisoara. I was surprised, but now that he mentioned it, I suddenly noticed that the landscape outside looked a bit different than what I remembered from previous trips to Timisoara. I asked him how this could have happened. After all, the train had left at the correct time and from the correct track. He explained that the train I wanted had been switched to line 3. I argued that the sign at the station displaying departures didn't indicate any such thing. His only response was "greseala, eroare" (mistake, error). That wasn't exactly the comforting response I was looking for. I sat for a moment, wondering what to do. Suddenly I jumped up from my seat and ran after the controller, who had passed on to the next compartment. I asked him where I should get off in order to catch a train back to Timisoara. He informed me that there was a train from Caransebes at 12:00, which would get into Timisoara at 2pm. Far too late. At this point I was about 15 minutes outside of Lugoj. Glancing out the window, I noticed that the main road back to Timisoara, E70, ran parallel to the train tracks. So, I decided I'd jump off at the next stop and try my luck with hitching. I knew it'd have to get me into Timisoara sooner than 2. So I gathered my things, and got off at the village of Gavojdia. I crossed the tracks and walked to the road. There was a little old lady there, apparently heading in the same direction as me. As it turned out, she was trying to get to Lugoj. I explained to her what had happened to me and she said the same thing happened to her on a few ocassions. We comisserated for a bit whilst flagging down vehicles. It wasn't long before a car pulled over, and it just so happened the driver was going all the way to Timisoara. So things worked out in the end. My purpose in going to Timisoara was to pay a visit to the State Archives. I was hoping to locate some official records that I could use to definitively prove Bela Lugosi's place of residence. My efforts turned out to be somewhat ill-fated, similar to my affair with the train earlier that morning. I suppose I should explain the recent developments regarding 'Project Lugosi' that brought about this trip to the archives. After the newspaper article that was published in February, there seems to be more public discussion of the project. A good number of people have approached me on the subject saying they actually learned something from reading the article. Apparently there has been further reportage on the subject, but it was done without my knowledge. Supposedly the local TV station did a piece, and the newspaper published another article. I haven't had the chance to see either of them yet; the only reason I know they exist is because a few folks have said they saw something connected to Bela Lugosi in the news. However, when I ask them to give further details, they can't seem to remember any. Alas. I suppose I'll just stop by the town library and peruse their old newspaper collections. Rumor has it that the latest article makes mention of a memorial plaque that was made a few years back, but was never mounted on Lugosi's home. Apparently the previous mayor had commisioned the plaque and tried to put it on the house, but his efforts were quashed by the stubborn refusals of the property owner. Upon hitting this dead end, the plaque was supposedly stowed in a dark cellar somewhere and forgotten. In fact, it turns out that this rumor is pretty much true. I confirmed it with one of my contacts at the town hall who said a plaque is indeed in existence, just sitting around collecting dust. He even invited me to come to the town hall sometime to see it. He also confirmed that the current owner of the house is a very difficult man, and added that before we can even think about trying once again to convince him, we need to procure the proper documents to prove his house is what we claim it to be. Later that day I talked to Mr. Bloch (the fellow who's been helping me with this project from the very beginning) about tracking down some official town records. He said that this would be difficult because many records were lost in a townhall fire in the early 20th century. Even still, he was able to provide me with a rather useful starting point, a detailed article about Bela Lugosi's early years. The article, "Dracula war ein Lugoscher" (written in German, as the title might imply), was published in 1993. While I can't read or speak German, it didn't much much matter. The important thing was that I was able to decipher the bibliography at the end of the article, which listed the primary sources the author used in writing the piece. One of the sources listed was the archives of the Catholic Church in Lugoj. Another source was the shool archives of Coriolan Brediceanu Lyceum, the very high school where I'm teaching. The next logical step, of course, was to seek out these sources. I first went to the church and asked the pastor if I could look at the registries. He told me, much to my disappointment, that any records dating before 1948 had been moved to the state archives in Timisoara. My next stop was the Coriolan Brediceanu school library. I asked the librarian to see the archives from the late 19th century. But, just like the pastor, she told me those documents had been moved to the state archives. So, it became evident that I'd have to visit Timisoara since all the documents of interest to me seemed to have been consolidated there. My next question was, 'how does one get access to the archives?' 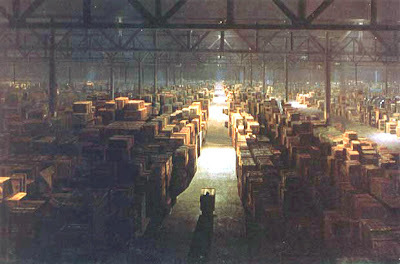 Based on previous experiences with official government institutions in Romania, I imagined the state archives to be something like the warehouse in the final scene of Indiana Jones and Raiders of the Lost Ark-- an inaccessible, chaotic jumble of abandoned artifacts. Anyway, I knew I needed an 'in,' so I paid a visit to the curator of the Lugoj history museum, Dr. Wallner. I wasn't sure how 'public' the archives were, so I asked her if there was anything special I needed to do in order to be granted access. Having lived in Romania this long, I've realize you can't always expect things to happen without the proper documentation. And not only is the paperwork itself important, but it's often even more important that everything be signed and stamped in triplicate. I figured the state archives would require much the same. However, when I mentioned it to Dr. Wallner, she simply said, "oh no problem, I'm colleagues with the director of the archives. I can give him a call and let him know you're coming." So, she did just that, and all was taken care of. As is often the case, it's who you know that makes the difference. So, I arrived at the archives this past Wednesday, after being dropped off by the lady who had given me a ride all the way from Gavojdia. She was a little peeved that I wanted to pay her 9 lei for the trip, and doggedly demanded 13, which I begrudgingly gave her. Entering through the main entrance of the state archives building, I was encountered with a rather large and gruff looking security guard. I told him I wanted to speak with Mr. Rus, the director. He looked at me mistrustingly and asked if I knew Mr. Rus. I replied that in fact I didn't, but I had been sent on the part of Dr. Wallner from Lugoj. He made a phone call, and apparently everything checked out, because I was let inside. I was shoed to the 'study room' where I was greeted by a rather attractive young lady (this was already turning out to be different than I had expected...) She sat me down at the table, and placed a stack of papers in front of me. Ahhh, paperwork, I knew it'd have to enter into the equation somehow. The bulk of the papers were forms I had to complete in order to obtain a reserach license, others were waivers and agreements. I read through them all, filled in the blanks and signed where neccessary. 'Glad to have the paperwork over with,' I thought. But, the formalities weren't quite over. The girl came back with a book of the archive's rules, regulations and procedures, which she plopped down on the table in front of me. Most of it was common sense, i.e. don't steal, deface or burn documents; don't take pictures without permission or without paying the fee; no eating, disruptive conversations, or violent behavior; and of course no dancing. I requested see the church records for 1882. However, the girl informed me that the registry had been sent to Bucuresti for micro-filming. I asked when it'd be back, and she said she really didn't know. This was just the answer I expected. Rather bummed, I moved on to the next thing on my list, school documents. I requested records of his first grade class (1893-4), second grade (1894-5) and third grade (1895-6). For each I had to fill out a request form, which I gave to the girl so that she could go off to the archives to search for the materials I'd asked for. When she came back, she had three booklets, one for each of the school years I'd requested. The books had the names of all the students in the class, and their basic academic information (essentially giant grade books). The funny thing was that these books looked frightenly familiar--Romanian schools still use the same archaic system for recording marks. Other than the fact that everything in these books was written in Hungarian, I felt like I was looking over one of the class catalogues currently being used at our school. Unfortunately, none of the class records listed a home address, so they didn't turn out to be the sources I was hoping for. But, even if they didn't mention an address, they did list his birthdate, religion, county of residence and father's name, so it seems like they covered every other tangential, mildly-relevant detail. The church registry surely would have recorded an address. And, as much as I'd rather not, I may have to take a trip to Bucuresti to see if I can find the regristry and take a picture of the lisitng for his baptism. Even while the class records may not have been the source I would have liked, they did offer some interesting insights. For example, it seems that Bela's father died sometime between 1894 and 1895, while the boy was in second grade. I inferred this because a cross appears next to his father's name in the catalogue from those years, but doesn't appear in 1893-4, nor do any other the other student's fathers have a similar cross next to their names. Another thing is that it seems Bela quit school halfway through the 3rd grade, since he lacks any marks for the second semester of 1896 (he would have been 14. I guess they started school later back then). Perhaps it was his father's untimely death that influenced Bela's decision to leave school. I certainly wasn't the first to look through these records to find out more about the famed actor's past. I know this because inside the front cover of each of the three books I accessed was a paper where previous researchers had signed. Before me, the most recent person to access the same records was a certain Petrina Calagalic in June of 2006. According to her notes, her purpose was "Documentary" and under observations she wrote "Bela Lugosi." So, my first trip to the state archives may not have been a complete success, but I learned some things, and now I have a two year certification to access the archives! Not quite as cool as a membership at Barnes and Noble, but I'll take it.